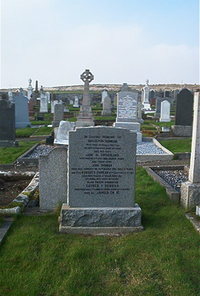 Benjamin Dunbar died at Cogle Watten 28th April 1949 aged 80. Wife Jane M Sutherland died 8th July 1966 aged 81. Son John Dunbar died 20th March 1966 aged 55. Son Private Robert S Dunbar 5th Seaforth Highlanders killed at Wadi Akrit 6th April 1943 aged 23. Daughter Esther I Dunbar died 1st August 1980 aged 64 wife of James Grieig.